Me? Okay, here is the short version: I love to enjoy life to the fullest. I love my honeybun and our incredibly awesome children. I love hiking and being outside. I love to sing and dance when no one is around. I love fabrics and antique quilts. I love colors. I love yoga and how it has changed my life. Drop me off at a bookstore in the morning and come pick me up late at night! This can also be said for any antique store. I love to create and I usually make a huge mess while doing so. I love to travel and immerse myself in different cultures. Above all I love to capture all these things in my photographs. I wish to capture all my memories and place them on a shelf in old glass jars and tattered vintage photograph albums. If you want the long version ... here you go! I was born and raised in The Netherlands. Born in Geleen, raised in Brunssum. A medium to small sized town in the southern part of Limburg. I lived a stones throw away from Belgium and Germany and a little town called Vaals. Home of The Vaalserberg. This is a hill with a height of 322.4 meters. Let me do the math for you: this is 1058 feet. With this dazzling height it is easily the highest point in The Netherlands. The Dutch call the hills of Southern Limburg: "Mountains". After moving to Colorado I quickly realized: “We were wrong!” Fun fact: "Did you know that 30% of The Netherlands is actually below sea level? Below!!" I am 40 years old, or as I like to say: thirty-ten. I have an amazing husband of 18 years who is an incredible human; a very hard working man who supports his family by being a firefighter. I have 5 super awesome children, Skyler, Lucius, Sem, Mickey and Billie whose ages range from 14 to 5. “Yes, there are four boys and a girl.” and “Yes, we were going to keep trying!” True: we gave our daughter a boys name, we just couldn’t break free from the boy pattern all together! We have a chocolate Newfoundland dog who is 4 years old, his name is Skipper - in the Colorado mountains where we live - he gets mistaken for a bear at least once a week so we added a loud bell to his collar. We also own, no let me rephrase: Five cats live on our property, we don't own them, they own us, which is a very “cat like thing” to do. Our chicken numbers go up or down, depending on when the raccoon and fox decide to visit for a quick fast-food meal. Usually we have upwards of 20 chickens and 1 turkey who is aptly named: Turkey. We live outside of Colorado Springs in the country in Peyton, Colorado nestled among pines on ‘our’ little hill. If you start following my Blog and my Day in the Life you will get to know all of my family real soon! People always ask: “How did you end up in Colorado?” Well you should ask my husband, he has a very funny story to tell you about that! Living in Colorado for 17 years now and never having lived anywhere else but The Netherlands I like to think of myself as a “Colorado Native”, I have tried several times to get the coveted ‘Colorado Native License Plate’ for my truck but the friendly folks over at the DMV don't agree with me. I got married during my last year of college. I had a short career in student teaching and not long after graduating we packed up all our belongings, our two cats and bikes we had collected and moved to Denver, Colorado. Not wanting to start teaching right away I found a job at a travel agency as a -you guessed it- European Specialist. After 9/11 happened all travel came to a screeching halt in the United States and my job was slowly reduced from part time hours to no hours at all. At this point we had moved to Colorado Springs and I was now working at the Broadmoor. At the same time our family started growing and I promoted to Stay-at-Home-Mom, the best paragraph on my resume! All along I used every free minute that I had dedicated to art and the creation thereof. 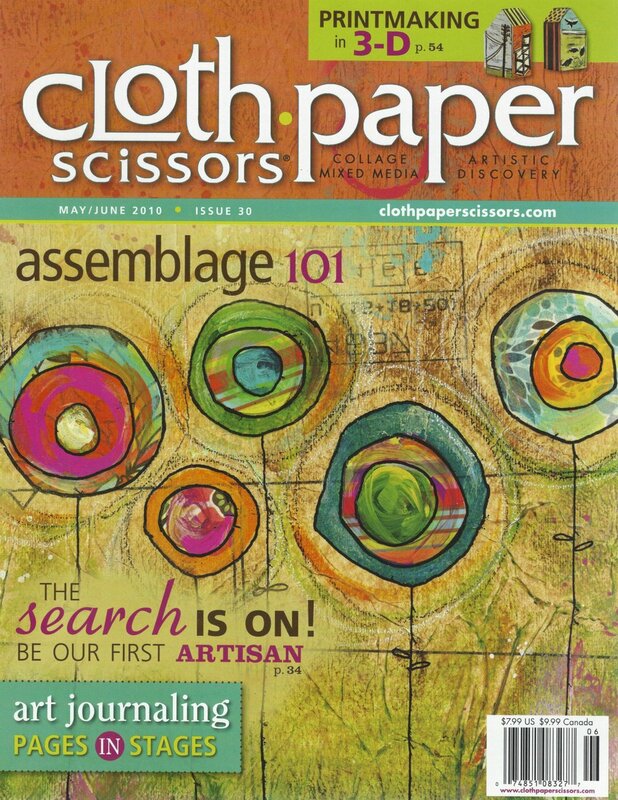 I have had success with writing articles for several magazines and art books, I will list those below. With now 5 kids I had less and less time to create art. As a dedicated mom I am now taking a lot of pictures of my children, to the tune of 100.000 pictures currently on my hard drive! As I was showing my photos to family and friends I got asked more and more to take pictures of their kids and families. Slowly my photography business came to be. As my interests grew and my talents developed in art, I started using textiles in combination with my photographs so I could play more with my images. Somewhere in the middle of this my life became fuller and fuller and heavier and harder. I discovered Yoga. Every day I drove through the Colorado prairie by a little gym that offered yoga, I knew this because it was painted with big letters on its stucco facade. One day I decided to just go on in and talk to the teacher. This day, I remember it clearly, changed the course of my life. Unlike every other sport I have ever attempted to take up, before never going back, Yoga was a practice that truly stuck with me. Slowly yoga evolved from just being a good workout and an hour away from the kids to a way of life. I simply wanted to introduce everyone I knew to the practice of yoga that had changed my life! It was eyeopening and so exciting at the same time. After a few years of practicing a dear friend -you know who you are!- encouraged me to take the plunge and sign up for a teacher training program that was offered on the other side of town an hours drive away. My intention was never to become a Yoga teacher but 'only' to deepen the knowledge of my own practice. During the five months of school my views slowly started shifting and I started seeing myself as a teacher. Or as my wise teacher said to me: "Inside of you you will find the voice of the teacher that you are meant to be." I now wanted to be able to offer everyone the tools that were offered to me, to start taking another look at yourself and to increase the quality of your life. It was exciting and before I knew it, I was feeling a burning passion to teach yoga! My little honey girl turned 5 years old recently and is starting a journey of her own. I am so sad to see her go, my last little bird off on her school path. I think she is far too little to hop onto that school bus every morning at 7 am. Yet I am so excited for the time that is now given to me to truly 100% apply myself to my passions, my career. And just maybe a little bit of time for my husband and I to go on daytime dates every once in a while. We acquired stand up paddle boards recently and I am just itching to make a few more dents and scratches on mine! Actually if you knew me better you would know, dings and scratches drive me absolutely nuts, I might even temporarily loose all logic and rational but I am working it. As my husband says wisely: "Every scratch and dent is another memory made". And I know he is right! And as if one career isn’t enough to focus on, the amazing aspect of all the things I love and am passionate about is that I can combine them all. Before you now beams a website that I have poured all my heart and soul into. 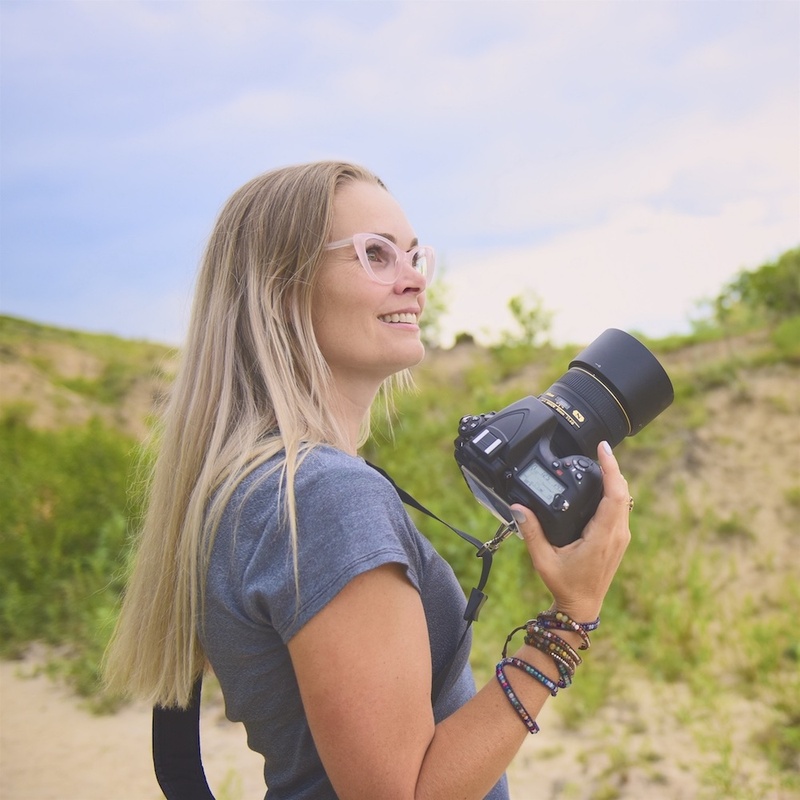 You will find Karin the Photographer, Karin the Yoga Teacher, Karin the Artist and Karin the Mom on the above tabs -Listed in no particular order of importance- As I start this new chapter I invite you to get to know me and my art, whichever medium it is for that day. I invite you to partake in one of my Yoga classes. I invite you to see the joy in life, to see its colors and feel its breeze. I invite you to squint your eyes because your future is so bright! You don't even know all the incredible things that are possible for you! Brunssum, my home town, is a municipality and a town in the province of Limburg in the Netherlands. Brunssum was a center of coal mining until 1973. The municipality of Brunssum has 28,840 residents as of 2017. Pictured is the Wieenweg, one of the most beautiful tree lined street in Brunssum, with homes draped in purple and blue Wisteria. They were built in the 1920's for Engineers working at the Coal Mines in Brunssum and surrounding areas. On my way to the one outdoor pool in Brunssum I would ride my bike by all these gorgeous homes. Headquarters Allied Joint Force Command Brunssum, HQ JFC Brunssum, is located in Brunssum, Limburg, the Netherlands, in the heart of Northwest Europe - an area which is often referred to as "the balcony of Europe", or "land without frontiers" because of its easy access to several countries. JFC HQ Brunssum was built upon the former HQ Allied Forces Central Europe's (HQ AFCENT) infrastructure, which has been in use since 1967 and former RHQ AFNORTH. This is where my husband worked while stationed in The Netherlands. Sittard has a small historic city centre with numerous architectural monuments, including several old churches (St Peter's, St Michael's, Basilica of Our Lady of the Sacred Heart), monasteries and a few half-timbered houses. The central market square has many restaurants and bars. The city has retained part of its city wall. On the south-eastern side of the city centre, the St Rosa chapel crowns the Kollenberg hill. 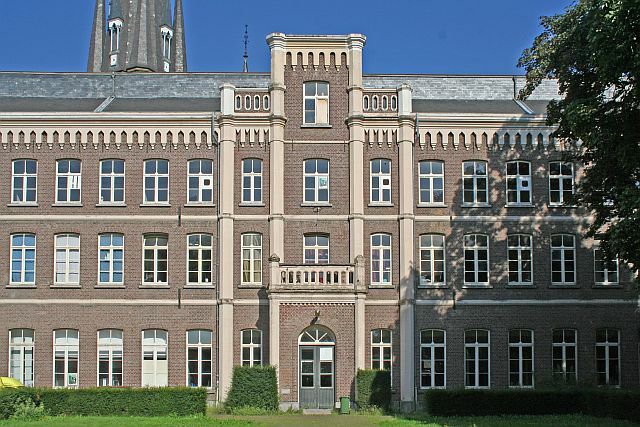 Pictured here is the monastery built in 1600 that I attended Fontys College at. The school has since moved away and the monastery was converted into luxury apartments. Tripoint (‘Het Drielandenpunt’) in Vaals is a tripoint where the borders of Belgium, Germany and The Netherlands meet. With a 'height' of 323 meter it is also the highest point of the Netherlands. More than just being an important symbolic location, it also offers one of the most spectacular views. Therefor it is the place to take your mother-in-law while visiting The Netherlands for the very first time. I might share pictures with you of this visit in a later blog! I am pretty sure I made a good first impression! Flood control is an important issue for The Netherlands, as about two thirds of its area is vulnerable to flooding, while the country is among the most densely populated on Earth. Natural sand dunes and constructed dikes, dams, and floodgates provide defense against storm surges from the sea. River dikes prevent flooding from water flowing into the country by the major rivers Rhine and Maas, while a complicated system of drainage ditches, canals, and pumping stations (historically: windmills) keep the low-lying parts dry for habitation and agriculture. 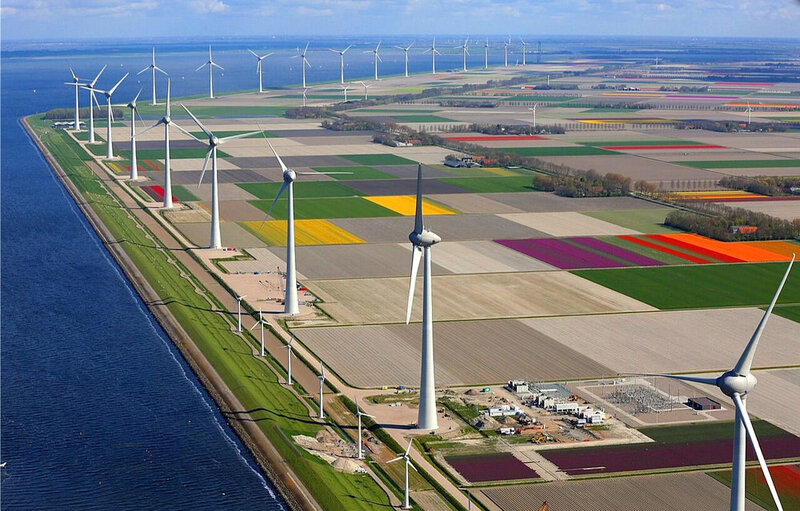 I have to tell ya, Dutch engineers constantly amaze me! Peyton was settled by George Peyton in 1888 and was surveyed and platted on December 25 of that year. Originally called Mayfield, the settlement was renamed Peyton after the post office had been refused under that name because there was already a Mayfield, California. Pictured here is our local general store. Only 7 minutes from our home, this store quickly became a staple in our lives as we are always running out of bread, wine and frozen pizza! Listed in no particular order of course.